It’s time for another customer profile. Ladies and gentlemen, welcome Fifi to the SPOTlight! RR: Hello there, you’re looking lovely. What’s your name? Can you tell our readers a little bit about yourself? 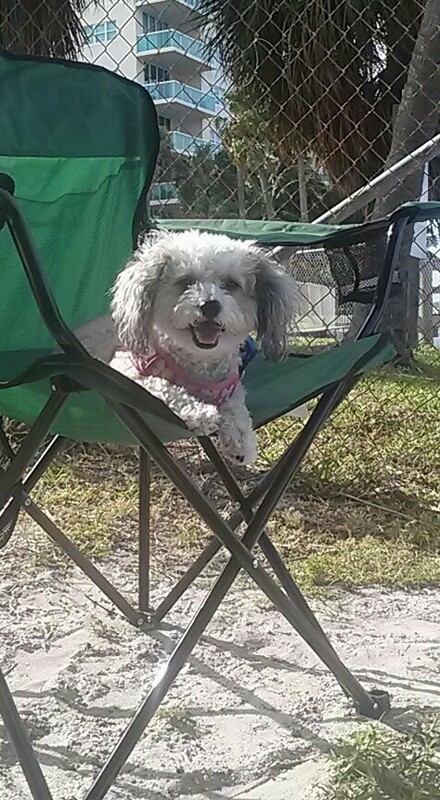 Yorkie-Poo: Whassup, I’m Fifi! I love laps, playtime, and road trips. I’m a person in a yorkie-poo body. I love rough-housing with my dad but it’s no fair ‘cause he’s way bigger, being a human dude and all. RR: You sound intriguing, Fifi. How did you come to own your humans? Fifi: Oh my word, those folks saved my life. I was on my way to the shelter, leaving my second family who just didn’t have enough time for me. Those were the dark days, when I spent at least 8 hours a day in a kennel with hardly any exercise or attention. I ain’t gonna lie, that was a tough time. But then my humans came along and fell in love with my sweet face instantly, and the rest is history. Now I do what I want when I want, pretty much – no cages, no leashes, no restrictions. It’s pretty awesome. My mom even cooks for me! RR (salivating): Wow. I’m jealous! Fifi (laughing): I bet you are, honey! Y’all can come over for dinner anytime. RR: Aw,thanks. What else should the public know about you? Fifi: Well, I love to dance and twirl (but not twerk, that’s just tacky). I love riding on my humans’ shoulders – I never fall off, even when I am walking from one shoulder to another. Guess you could say I’m pretty talented. But if you ignore me, I’ll let you know, know what I mean? Even if I have to crawl all over you, climb in your lap and sit my booty down. Oh, and my parents think I'd look and sound like this lady if I were human. She doesn't have as pretty curls as I do but she is talented, so I'll go with it. RR: I heard that. Loved her on Glee. Well, what’s your stance on cats, Fifi? Fifi: Oh honey, I hate ‘em. I tried to give ‘em the benefit of the doubt, even introduced myself to one once, but I got rudely rebuffed. I’m still upset by it, honey, when I think about it too much. Now I steer clear of all of ‘em, even (ahem) my aunt’s ceramic one. I’ll tuck my tail, put my ears back, and jump into your arms if one of them nasty felines crosses my path. RR: Why do you come to Pet Groomerie, Fifi? Fifi: Oh child, I love this place. We saw the Pet Groomerie ad on Facebook and made an appointment. My humans and I were real nervous the first time ‘cause we hate to be separated and because of my unhappy past, but when I met the groomers and staff, I was all calm, cool, and collected. Now I feel right at home here. And, well, look how smokin’ I look when I’m all done! RR: No argument from me there, Fifi. You look marvelous, darling. Well, folks, you heard it here first: Fifi the Yorkie-poo, another high-stepping, sass-talking member of the Pet Groomerie family. We love you, Fifi. Mwah!